‘Jack’ Power, labour reformer, was a senator who never was. 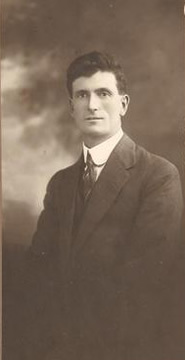 Only forty when chosen by the New South Wales Parliament to fill a casual vacancy caused by the death of Senator Allan McDougall in October 1924, Power died two months later, before taking his seat. Had he lived, he would have been a senator only until June 1926, since he had not been selected for the federal election of November 1925. His career is of interest in illuminating the paths that would-be senators in the New South Wales Labor Party had to tread at that time. Power was born in South Hay on 15 December 1883, the fifth child of John Maurice Power, a carrier, and his wife, Maria, née Toohey. John and Maria, who were Irish immigrants, had married in Echuca, Victoria, in 1877. The family had moved to Sydney by the turn of the century and Power was active in Labor politics from an early age. Indeed, his was an exceptionally intensive political life. From 1910, he was a regular delegate at state conferences. He was prominent in opposing the Federal Labor Government’s referendum on the nationalisation of monopolies in 1911, and took part in the anti-conscription campaigns of 1916–17. Closely allied with the Australian Workers Union (AWU) in its dominant years after the war, he rose to be state president, federal conference delegate, and a member of the New South Wales Legislative Council, all within a few short weeks in 1921. From 1918–24, he served on the ALP Federal Executive. Power came from a background that was by no means unusual in Labor politics at this time, but was not quite of the mainstream either. He did not have a distinct industrial base, though his rural ties had assisted him in developing relationships with the AWU. He came to prominence in the local electoral leagues of the Labor Party, becoming president of the Paddington branch in 1912. He was also active at the local government level as an alderman of Paddington (1914–17) and mayor (1917–18). By 1915, he was attached to the industrial groups formed by the AWU to contest the policies of the Holman Government. Over the next ten years, until his death, he played a significant role in the convoluted factional and industrial struggles of the period. Politics must have been Power’s obsession. His range of occupations—rural worker, drayman, taxi-driver, union secretary—suggest versatility. In the eyes of his opponents outside the Labor Party, he had a reputation as a man always seeking the next rung up the ladder. Yet he was a genuinely popular man in the labour movement and he does not seem to have been regarded as one of the ‘uncouth crooks’ of the New South Wales Labor Party executive, referred to by J. M. Dooley, and Albert Gardiner. Power adopted a moderate position at the 1923 ALP conference as the AWU went down to defeat and his own union career came to an end. However, he retained his usefulness between 1923 and 1924 by assuming editorship of Labor News from W.A. Gibbs. Power’s reformist zeal had not been blunted by his life appointment to the New South Wales Legislative Council in August 1921 when he implored fellow councillors to vote ‘to abolish this Chamber as promptly as possible’. At this time, he called for a strengthening of Australia’s defence and decried the social effects of the profit motive: ‘Private profits are made . . . by the continuance of conditions which are . . . utterly detrimental to the community . . .’. It was known that Power was ill in early 1924—the Federal Executive in May that year noted the fact with regret—but six months later he was chosen for the Senate casual vacancy by a joint sitting of the New South Wales Parliament. At this time, the Premier, J. T. Lang, made it clear that Power was to be a short-term senator, who would serve only until the following election for which he was not preselected, and then would retire to private life. Power’s sudden death on 13 January 1925 at Glenbrook in the Blue Mountains shocked all sections of the labour movement. On 21 January 1911, he had married Alice May Duggan at St Francis Roman Catholic Church, Paddington. Alice died on 4 June 1913. Then, on 4 November 1918, he married Stella Horrigan, who survived him. There were also two surviving sons, John and Gordon, the only children of the first and second marriages, respectively. After a service at the Sacred Heart Church, Darlinghurst, where he and Stella had married, Power was buried in the Roman Catholic Cemetery, Randwick. Power was seen as ‘one of the brilliant young men’, who might have had great achievements before him. However, that appears to have been improbable. Health issues aside, the period was not propitious for the political forces Power had represented and his elevation to the Senate marked in every sense the end, not the beginning, of a political career. Graham Freudenberg, Cause for Power: The Official History of the New South Wales Branch of the Australian Labor Party, Pluto Press, Leichhardt, NSW, 1991, pp. 116–117, 128–129, 137. Bede Nairn, The ‘Big Fella’: Jack Lang and the Australian Labor Party 1891–1949, MUP, Carlton, Vic., 1995, pp. 48–56; D. W. Rawson, The Organisation of the Australian Labor Party, 1916–1941, PhD thesis, University of Melbourne, 1954, p. 24; Patrick Weller and Beverley Lloyd, Federal Executive Minutes 1915–1955: Minutes of the Meetings of the Federal Executive of the Australian Labor Party, MUP, Carlton, Vic., 1978, p. 65. NSWPD, 22 November 1923, pp. 2666, 2667, 13 December 1923, p. 3432. NSWPD, 20 November 1924, pp. 3856–3864. CPD, 10 June 1925, pp. 13-14; Daily Standard (Brisbane), 14 January 1925, p. 4; NSWPD, 20 November 1924, p. 3860. This biography was first published in The Biographical Dictionary of the Australian Senate, vol. 1, 1901-1929, Melbourne University Press, Carlton South, Vic., 2000, pp. 70-71.